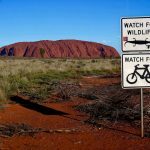 Careering off into the outback isn’t a spur of the moment decision. 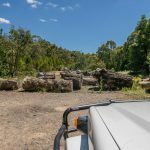 Your vehicle could be the only thing separating you from a fun 4WD off-roading trip and a battle for survival, so it pays to make adequate preparations before you accelerate off into the red horizon. The first place to start is with a full service. 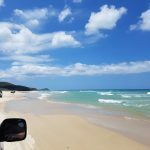 Do this within a month of your trip so you can be absolutely sure there are not going to be any imminent problems at the time of your departure. I always book mine in three weeks before. I figure that this is enough time to fix even the biggest of problems, ensuring my departure date won’t be delayed. Starting from the bottom, make sure your bolts and nuts are all done up tightly and your tyre pressure is appropriate for the terrain. You will need to check the nuts and bolts regularly on rough terrain. Some Australian roads are savage and make light work of unscrewing a nut or bolt. Ensure you know how to change a tyre and your spare is present and in good working order. 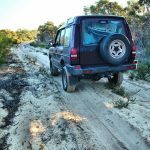 Adding after-market suspension is a serious booster if you are taking your 4WD into the outback. I already mentioned the savage road conditions, and after-market suspension will give your vehicle a longer life expectancy than if you leave it equipped with the factory standard. It should also give you more clearance over obstacles, and allow you to carry a heavier load far more safely. 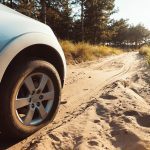 Check the shock absorbers before you set off on an outback trip. They are often overlooked, but they will be needed once you get out in the sticks. Check for wear and leaking, replace any that look defeated. In the outback, there are plenty of roos waiting to give you an expensive repair bill for a new radiator. Fit a bull bar, and protect your vehicle. While you’re at it, investing in a couple of side steps and underbody protection will protect your rig from stone damage and keep everything running smoothly underneath. The outback is going to put your vehicle through it, best send it into battle armoured up. Check all your lights are in good working order before you set out. If you are going to buy additional spotlights for the trip, and I recommend it, invest in good quality lights. Last time I went camping in the outback, I bought a cheaper set of halogens I had got a good deal on. The outback made light work of the clearly inferior quality lights, the constant rough terrain was just too much for them. I wouldn’t mind, but the road wasn’t even one of the tougher stretches of road. The outback separates the good quality from the bad pretty quickly. Get a physical copy of your make and model workshop manual. This is not only useful to you if you need to check something or make a couple of tweaks, but if something does go wrong and you need to visit a small, rural mechanic, having your workshop manual to hand might be a blessing. Preparation is key for any outback adventure. If your vehicle is in perfect condition before you set out, it is in the best possible position to do battle with the elements. You have done all you can for it, now it must do the rest. Load it up and head out.